Ouch! I hope your pain will go away soon. Please take it easy and rest well. Ouch is right! 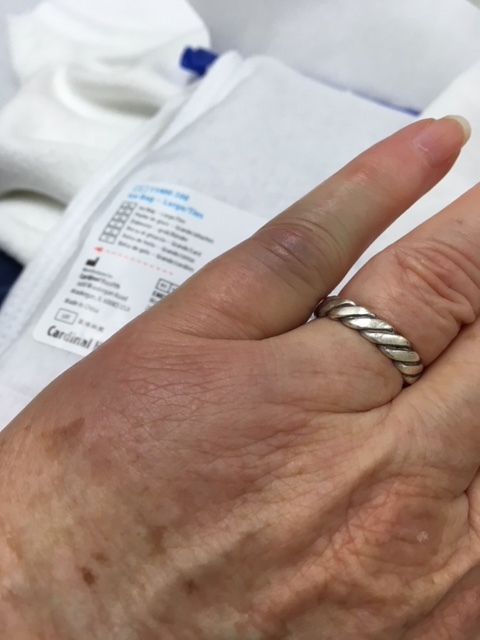 The broken finger, which is splinted, is actually less painful than the bruised rib. That pain is constant and annoying! Thank you so much for the good wishes. But, try and enjoy your enforced time off as an excuse to slow down for a bit. Catch up on old magazines, read, travel plan, enjoy old movies . . . this too shall pass. BTW, off to hike the San Clemente beach trail today, followed by lunch in town! Who has time for this is right! At least my legs are OK, so we’re still getting out for our daily walk. But there’s lots I’d like to be doing around the house that I can’t for the time being. I envy you your hike on the beach trail. A part of my heart will always be in San Clemente. Forced down time is OK for a while, but I can already feel myself getting antsy. Brett won’t let me do anything though, so I’m going to have to tough it out. Oh dear! Sorry to hear this. And really happy that you landed on grass. Take the time to catch up on whatever you can enjoy. As others said, forced down time. Oh Laurel – what a horrible thing to experience on your trip. So glad to hear that all is OK even if you did get roughed up a bit. When I told Brett he said we will be holding on to each other tightly the whole time. Yes, I pretty much freaked out my DH and daughter, not to mention that adventure really draws a crowd. 😂. So glad Brett is keeping you down a bit. DH is doing the same with me. Like you, I don’t do nothing very well. Ouch, is right. I’ve had numerous fractured ribs due to my cancer (myeloma affects the bones) and they take a good long while to heal. Even if yours is just pulled or strained, it will take a while. Just chill thru it, not much you can do. I am so sorry to hear that you have had to deal with so many fractured ribs. Pain is my constant companion right now, so I can only imagine what you’ve had to deal with over the years. I’m chilling as much as I can. Sorry to hear this, Laura. Take it easy until you feel well again. Blogging can wait. Brett is not letting me do much of anything. The whole thing is so annoying! I can’t even imagine trying to write a blog post now. I’m pecking this out with one finger on my phone – it’s as good as I can do. Oh, no! Hope you heal quickly, Laura. It’s nice that, even while being injured, you have taken time to reflect on what you are grateful for. Thanks for the wishes. My finger feels like it’s healing, but the bruised rib continues to be annoying. Grrrr! I am grateful that it wasn’t worse, and that Brett is able to step up and take over many of my duties.